Broadcasters are embracing digital and social tools as they look to make sports more exciting than ever for fans. At Turner Sports, Senior Vice President Valerie Immele is exploring new ways to reach millions of fans with real-time marketing and content, including programmatic video advertising. At Turner Sports, we're focused on sharing the love of the game with all fans, in any way they want. So when Google approached us about an experiment called Project Instant, we were intrigued. The project promised to help the NBA on TNT extend the reach for NBA Season Tip-Off 2016 events using programmatic video advertising. While programmatic video advertising isn't a new concept, the idea that we could gather real-time content on the ground and instantly make it available to fans was an exciting prospect. The tip-off events are a key focus for our marketing team—and the more we can amplify those events, the more mileage we get for our budget. 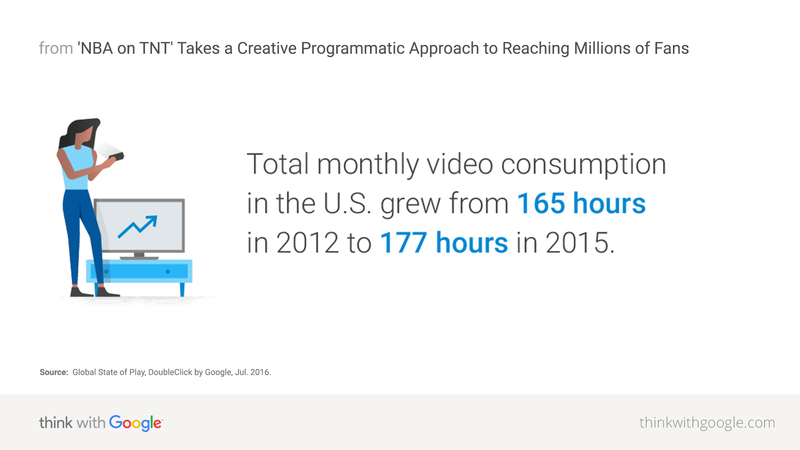 We don't see digital and mobile video consumption cannibalizing TV; mostly it's additive. NBA fans are very engaged digitally and socially, so we've built digital products, such as NBA League Pass and TNT Overtime on NBA.com, to facilitate that engagement. Those products extend beyond live games and programs. We are always looking for new ways to connect with fans. Ultimately, our goal is to facilitate connections and engagement between fans and the sports teams they love. To that end, we're always thinking of new ways to experiment with technology and interesting ways to reach our audiences. Source: Global State of Play, DoubleClick by Google, Jul. 2016. As part of Project Instant, we captured real-time videos from our tip-off events in Cleveland, Chicago, Portland, Ore., and Oakland, Calif. Our on-the-ground teams captured footage highlighting four content themes: on-air talent, the NBA athletes, behind-the-scenes footage of event setup, and the fans. The goal with this content strategy was to help viewers who couldn't make it to the games experience the excitement as if they were there. We launched a programmatic video advertising campaign through DoubleClick, which delivered our videos as YouTube TrueView ads to 6M unique viewers across the U.S.2 That's millions of people that were exposed to our content, even if they weren't tuned into the games live. We worked with our Google team to build out audience lists based on the types of people we'd successfully reached in previous AdWords campaigns. And the DoubleClick algorithms also helped us learn which audiences were the most relevant, so we further optimized and refined our audience lists even after the campaign began. Because the TrueView format is skippable, we only paid for viewers who stuck around to watch the videos. 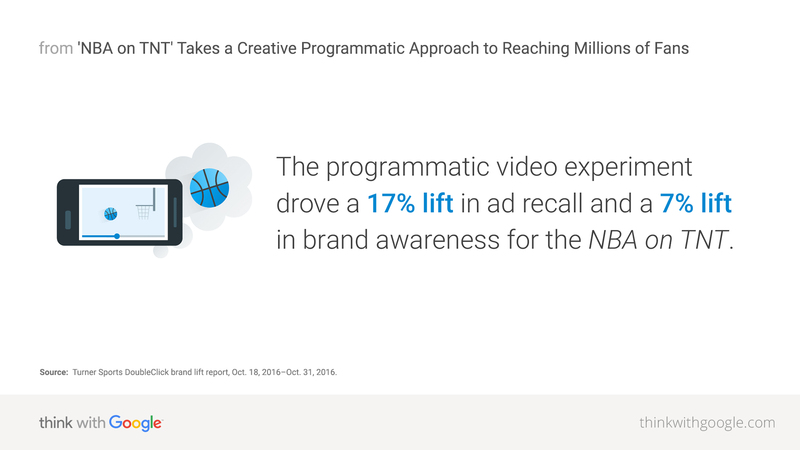 Ultimately, we were able to drive the story around the NBA Season Tip-Off 2016 and drove a 17% lift in ad recall and a 7% lift in brand awareness for the NBA on TNT.3 This campaign demonstrated for us the potential of programmatic video advertising, and we plan to continue using programmatic advertising to complement our live broadcasting, reaching as many people as possible with our video content. Source: Turner Sports DoubleClick brand lift report, Oct. 18, 2016–Oct. 31, 2016. This campaign was successful because we were able to help NBA fans feel like they were part of the live action, even if they couldn't be there in person. We helped connect them to the sports community they cared about. That personal connection is what we want to support through all of our programming and marketing. Because at the end of the day, our job is to help fans take part in and share the love of the game, in any way they want. Project Instant also helped Paramount Pictures find new audiences for its Star Trek Beyond franchise. Stay tuned for Part 2 of this series. 1 Global State of Play, DoubleClick by Google, Jul. 2016. 2 Turner Sports DoubleClick campaign report, Oct. 18, 2016–Oct 31, 2016. 3 Turner Sports DoubleClick brand lift report, Oct. 18, 2016–Oct. 31, 2016. Shock Top had a Super Bowl commercial in the big game. But that wasn't the point.